The Large Hadron Collider is about to turn useful, people. Having recently jacked up its particle acceleration power to create 3.5 TeV (trillion electron volts) collisions, the researchers are today pressing ahead with plans to go to a full 7 TeV, which -- you won't be surprised to hear -- has never been done before. Provided the requisite 3.5 TeV per beam is reached, sustained and properly channeled into creating useful collisions, CERN will finally have the data it needs to start its long-awaited physics program based off the findings provided by the LHC. Best of all? The latest world record attempt is being broadcast live over the web right now so why not hit up that link below to witness some history in the making? Update: The momentous first protonic collisions at 7 TeV have just taken place, at just past 1PM CET. Now the time comes for researchers to parse all the incoming raw data, pore over it, analyze it, etc. We'll leave that to them, it's not like you can expect the God Particle to be discovered instantly. To fill the time, we invite you to come past the break for our blow-by-blow updating adventure from this morning plus video of the big moment. 8.38AM CET -- Hello! It wouldn't be the LHC without something going wonky and sure enough, we're told a power converter went down while things were ramping up this morning. Not to worry though, apparently these things happen often, and will be overcome without much fuss. First collisions are expected in about two hours. 8.56AM -- They've lost a beam. Cryogenics problems have caused one of the beams to go astray, meaning that the ramping process will have to be restarted. It's been four minutes now and they've yet to determine what the particular cause was or where that beam went. People near the Franco-Swiss border should probably remain indoors this morning. 9.40AM -- Time until the collisions is being filled with tours of the experiment control rooms. Lots of trendy people in there, wearing checked shirts, scruffy jumpers and denim jackets -- and hey, a dude named Wolfram! This is like a bad Bond movie. 10.09AM -- Earlier issue has been identified as an "electrical perturbation" that took out a couple of sectors of the LHC. The magnets in the relevant areas are presently being reset, which should take about an hour, to be followed by a new beam being injected and then ramping starting anew. Judging by all the interviews they're doing, we suspect they might be stretching this thing out just to give all of their physicists some screen time. 11.47AM -- Wake up, they're back! The beams are now in position and are about to begin acceleration within minutes. Former project leader Lyn Evans was brought out for a quick interview and given just enough time to express that he's "very confident" things will go right this time. 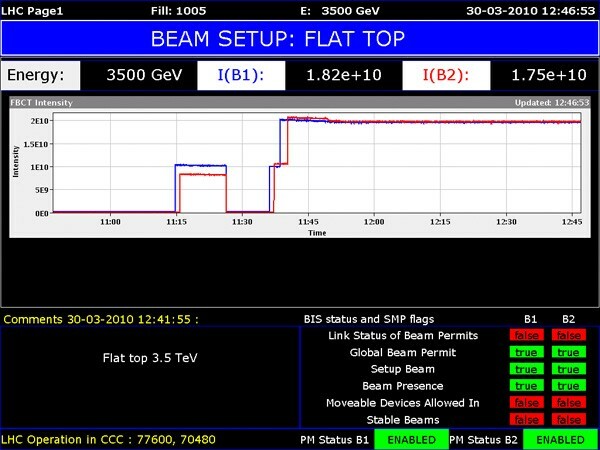 12.02PM -- We've just passed 1 TeV of energy per beam and are slowly but surely ramping up to the full 3.5. Full energy is expected at 12.30PM CET, so if you have anything you want to do before the end of the world, now might be the time to do it. You know, just in case. 12.37PM -- 3.5 TeV reached on each beam, and we're still here. Everything is in place, now all that remains is the tiny matter of smashing the protons into another one. 12.59PM -- The beams are being brought closer and closer together. And yes, they're now aligned! The LHC is in collision mode, we're almost there. 1.01PM -- They need to establish stable beams before delivering the protonic crashes. We still think they're teasing it out for dramatic effect. 1.05PM -- Finally! First collisions at 7 TeV are now happening at a rate of 40 events per second. 1.24PM -- Nothing exciting left for us here. Just a bunch of scientists tidying up particle trajectories and collating tons of data. We'll leave them to it, and we'll leave you with a video of the big excitement.